A young woman living on the street has to keep her wits about her. Or her friends. But when the drugs kick in that can be hard. Anton has been looking out for her. She was safe with him. But then Steve came along. He had something over Anton. Must have. But he had a flat they could crash in. And gear in his pocket. And she can’t stop thinking about it. A good hit makes everything all right. 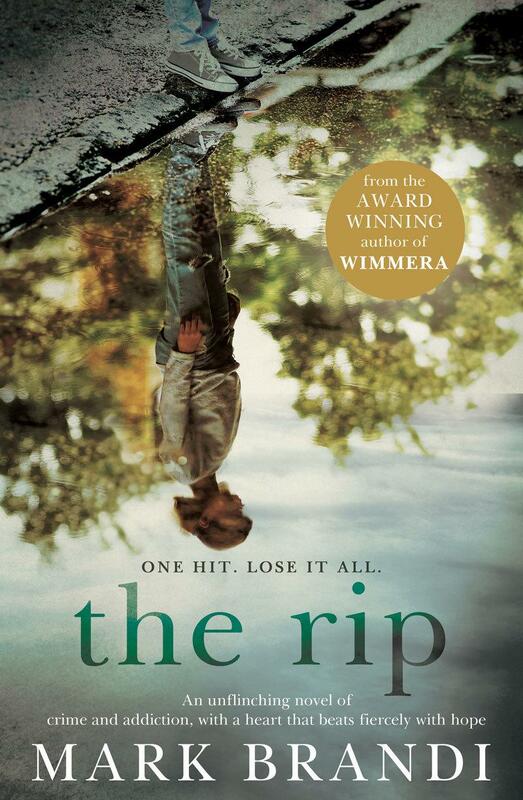 If The Rip has any antecedents it’s probably novels like Helen Garner’s Monkey Grip and the late Andrew McGahan’s Praise; its gritty look at the underbelly of our society is raw and unflinching and at the same time hopeful. Fifteen, even twenty years ago homelessness was barely visible on our streets, now on any busy inner-urban shopping strip the sight of people begging or sleeping rough is commonplace. The question of how to explore these phenomena and portray the inner lives caught within them is an interesting one. Mark Brandi has succeeded in doing so, making the characters that inhabit this underworld believable and intriguing. Dani and Anton have hooked up, not romantically, they just look out for each other on the streets. Anton has a fantasy that one day they can get a place together – not that sleeping under the stands at Princes Park is that bad, but having their own place would be better. Dani’s got a bit of a habit, nothing she can’t control of course, as she tells Anton incessantly. He won’t take the stuff, just some downers, but they aren’t really drugs. Dani turns a few tricks to fund her habit, not many, just enough, and Anton looks out for her but he hates her working. Anton’s been in gaol, for manslaughter, but it wasn’t his fault, he was defending a girl. Dani likes hearing the story but notices that every time he tells it, it changes slightly. When they hook up with Steve, someone Anton knows – how, he won’t say – their lives change dramatically. I’m so pleased Brandi has written this book; it’s powerful, compelling and makes you think. Quite a triumph, really.